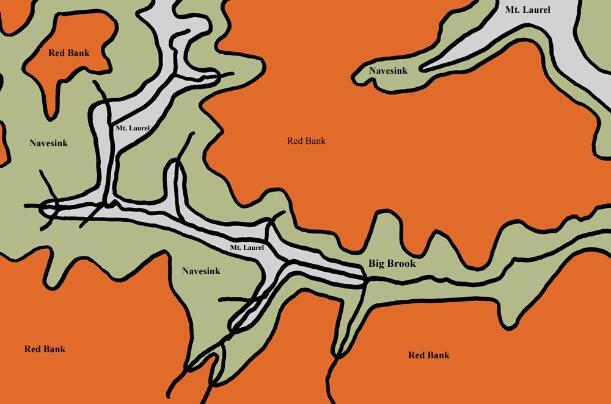 drainage basin of Big Brook are within the Inner Coastal Plain. westward as the Gulf Coastal Plain. Click here (Picture from Ref. 3) to see the shore line during the Late Cretaceous. continental to marginal marine (estuary or lagoon) to full marine. and falling (regressions) of the sea level. This rising and falling cycle deposited the formations into three different shelf regions. These are the inner, middle, and outer shelf. amounts of clay and feldspar. point out that some deep-water elements occur in the relatively shallow environments and vise-versa. Marshalltown fauna has been reported from this locale. all, one can see why so much confusion has surrounded these enigmatic surface exposures of the Mt. Laurel. mica may run over the contact for about a meter into the Navesink. The Navesink formation is a thick greenish-grey sandy clay and is much more homogenous than the underlying Mt. Laurel. (about 26 feet) thick at Big Brook. Exogyra "zone", the minor Agerostera / Choristothyris "zone", and the Pycnodonte "zone". been affected by the low oxygen levels that the bottom organisms would have. noted for specimens that are collected in situ. the larger shells was probably too much for them and they died just as found. casts of bivalves and gastropods. members, the lower Sandy Hook member and the upper Shrewsbury member. fragmentary. Not more than 3 meters (about 10 feet) of the Sandy Hook member is apparent. sand. This member is largely unfossiliferous but does contain some isolated small pockets of fossils. (about 120 feet) of the Shrewsbury member is exposed along Big Brook. 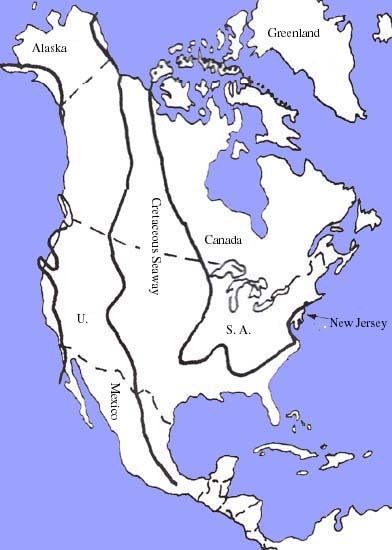 the Cape May formation which was deposited during the last interglacial period before the Wisconsin glacial period. this last great episode at Big Brook. The Geology of Big Brook! Cape May (equivalent) - Fluvial deposition. Up to two meters thick. Not always present. Cross-bedded light to dark sand and gravel. May sit on to top of the Red Bank, Navesink, or the Mt. Laurel. been reworked from the other formations. and bones occur near the contact. contain empty casts of Belemnitella. sands. Localized phosphaic bone beds. Red Bank (Shrewsbury member) - Inner shelf deposition. (Sandy Hook member) - Middle to inner shelf deposition. Brook. It contains mostly invertebrates in a least 3 main shell beds.